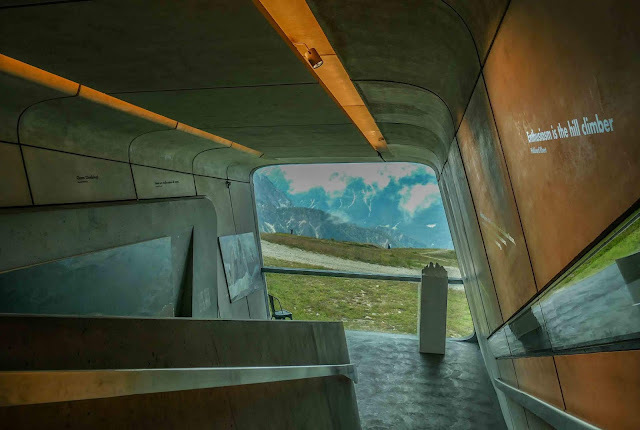 This weekend while we were holidaying in the Trentino Alto Adige Region of Italy, we came across the Messner Mountain Museum (MMM) Corones located on the top of the Kronplatz Mountain, which is the final instalment of the six mountaintop museums. 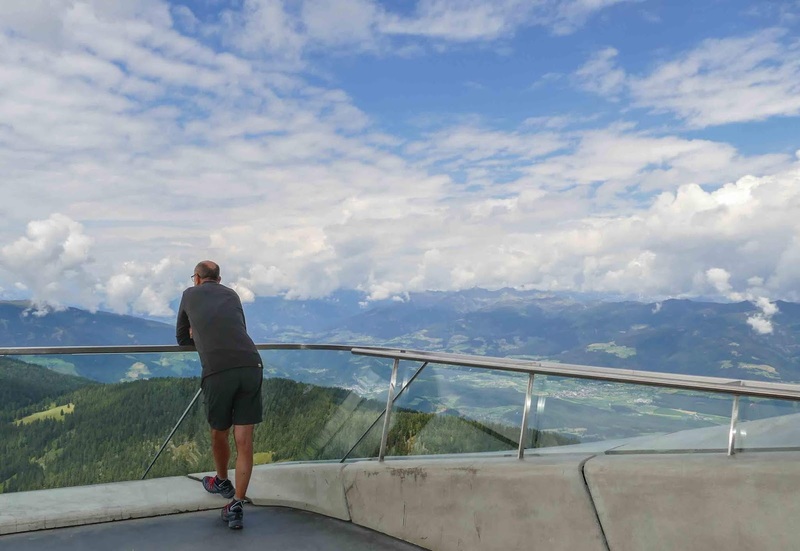 During the summer there are only three operating cable car accesses to the top of Kronplatz: Valdaora/Olag, Brunico/Brunik and Piz de Plaies/San Vigilio. We took the first one which was costing € 19.00 per person without the Regional tourist card holders discount. 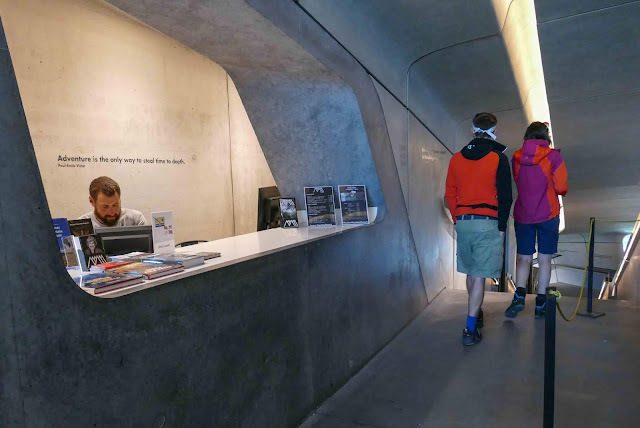 Hotels that adhere to this tourist program normally give you for free upon check-in the Alto Adige Tourist Card which gives free access or special discounts to busses, trains, cable cars and museums. We had the card which gave us 10% off on the normal price. The ride from Valdaora to the summit lasted only 20 minutes with a very fast stopover in a middle station located along the way. Seems that normally the rides starts at 9 am and finish at 5 pm. The entrance ticket to the MMM was € 10.00 for adults and € 4.00 for children. ID proved seniors over 65 and students until 26 have a special price of € 8.50. This same offer was valid also for visitors with wheel chair and groups over 15 persons. What caught our attention was what they called the family ticket which was € 22.00 for the whole members of the same family. We thought this could be well appreciated by couples with children because most of the times families avoid doing things because of the high amount of price to be paid. Actually MMM consists of six museums based in six different locations: Firmian, Juval, Dolomites, Ortles, Ripa and Corones. MMM Firmian at Sigmundskron Castle near Bozen is the centrepiece of the museum and concentrates on man’s relationship with the mountains. MMM Juval at Juval Castle in the Burggrafenamt in Vinschgau is dedicated to the "magic of the mountains", with an emphasis on mystical mountains and their religious significance. MMM Dolomites at Monte Rite, housed in an old fort, is dedicated to rocks, particularly on the history of the formation of the Dolomites. 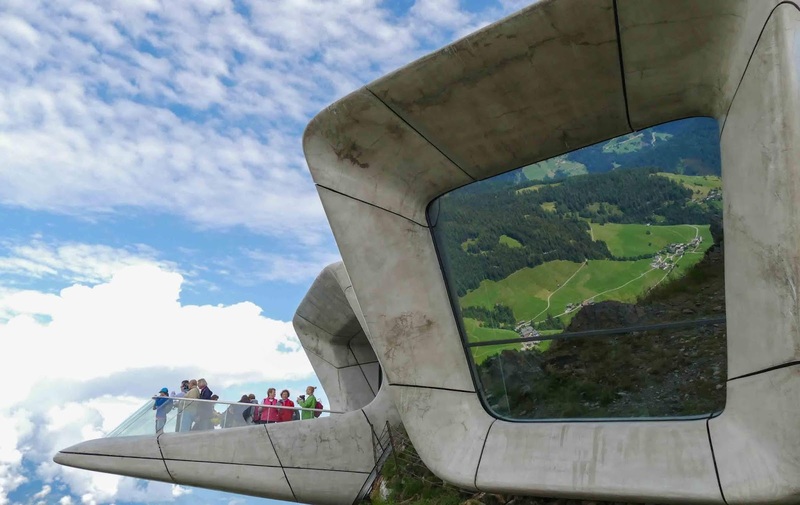 This museum contains a summit observation platform that offers a 360° panorama of the surrounding Dolomites. MMM Ortles at Sulden on the Ortler is dedicated to the history of mountaineering on ice and the great glaciers of the world. MMM Ripa at Bruneck Castle in South Tyrol is dedicated to the mountain peoples from Asia, Africa, South America and Europe, with emphasis on their cultures, religions, and tourism activities. 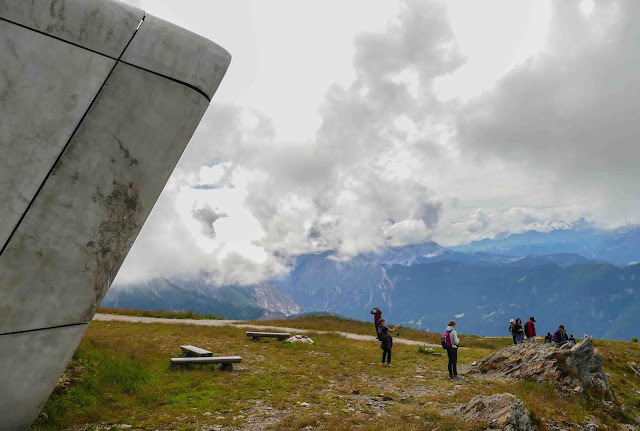 MMM Corones on the summit plateau of Kronplatz (2,275 m) is dedicated to traditional mountaineering. 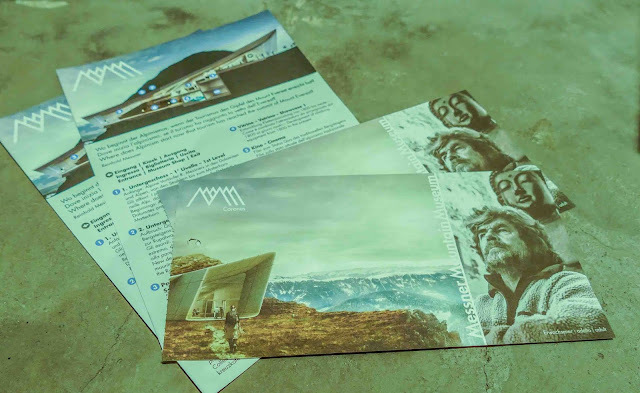 The project, conceived by an Italian mountaineer and extreme climber Reinhold Messner (the first climber to ascend all 14 mountains over 8,000 metres and to reach the summit of Mount Everest without additional oxygen), was created to educate people on "man's encounter with mountains". A London-based Iranian architect, Zaha Hadid (31/10/1950-31/03/2016) designed and developed a structure built into the side of the mountain, emerging only at certain points to offer specific views. Three large volumes made by glass-reinforced fibre and concrete appear to burst through the rock face and it is absolutely impressive. One more concrete form emerges from the ground to create the building's entrance. 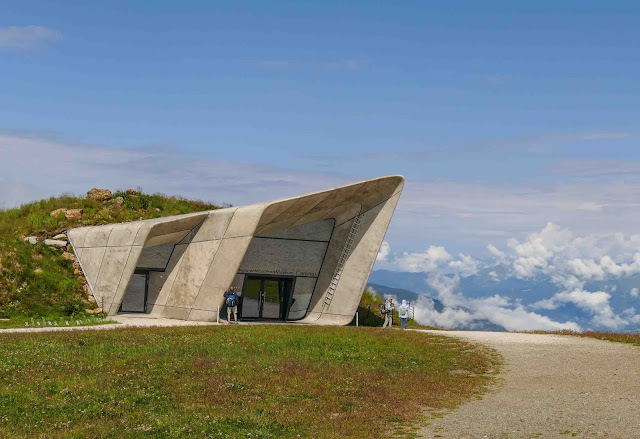 Zaha Hadid's firm chose cast concrete to give the appearance of rock and ice shards, referencing the geology of the region. 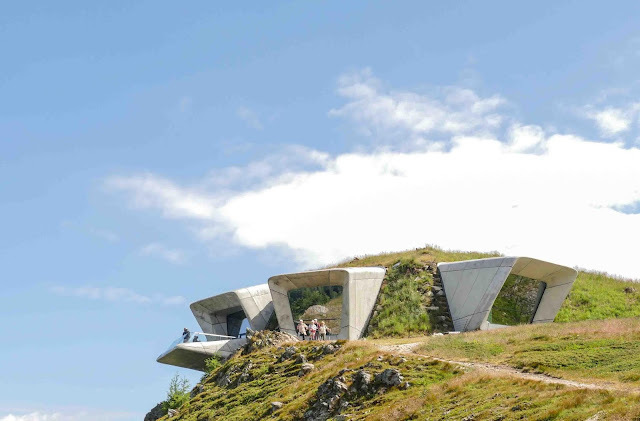 Her idea is that visitors can descend into the mountain to explore its caverns and grottos, before emerging through the mountain wall on the other side, out onto the overhanging terrace with its spectacular panoramic view. The walls of the building are between 40 and 50 centimetres thick in order to support the structure from the pressure of the surrounding earth, while the roof has thicknesses of up to 70 centimetres. Inside instead, is organised over three floors, connected by staircases that the firm described as being "like waterfalls in a mountain stream". The view from the museum or from the terrace is not certainly better than what you can see from the outdoor areas but a visit to the museum let us knew on one side how men want to be more and more powerful than nature and on the other side how mountains are just rocks without men’s soul. Moreover MMM Corones offers private visits and you can also have exclusive hire of the museum for private receptions, presentations or meetings. Wow what an unforgettable atmosphere it would be having the whole building for ourselves.